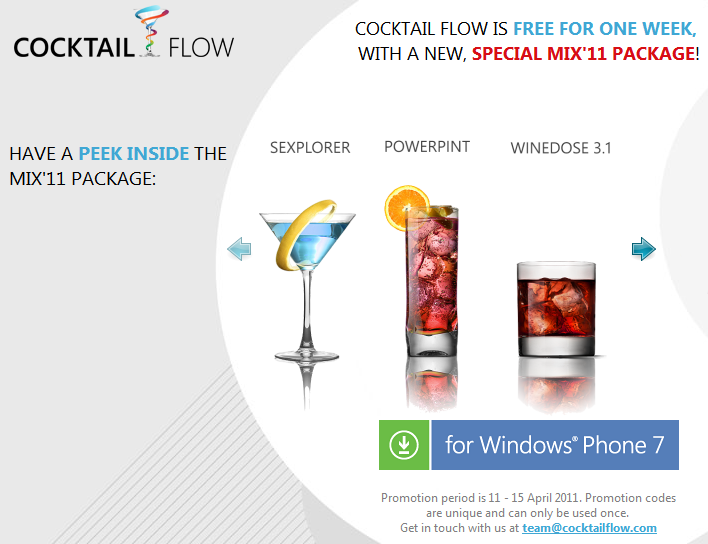 If you you’ve never heard of Cocktail Flow you are missing out on a beautiful, well designed, and well supported application on the WP7 platform. Cocktail Flow is not an application exclusive to cocktail lovers. It’s also created for those wanting to discover and enjoy the art of cocktails. Take a look at the features, the screenshots and the video to see why you should be excited about it. 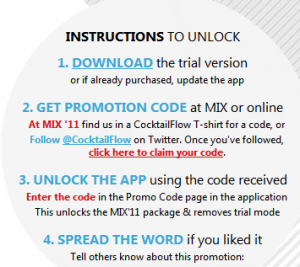 For this week, the week of MIX ’11, Cocktail Flow is celebrating by offering promotional codes for the full application free of charge. Normally, the application costs $2.99 and is well worth the price regardless of this promotion. The promotion will last from April 11 – April 15 and you can find all the instructions in the image below (or this link).